Or raw images mast cam, 1355, in the middle and scroll down a bit. Phew, he did a better job of computer enhancing it, but my attempt is good enough, (control C, or true color doens't work on this one). 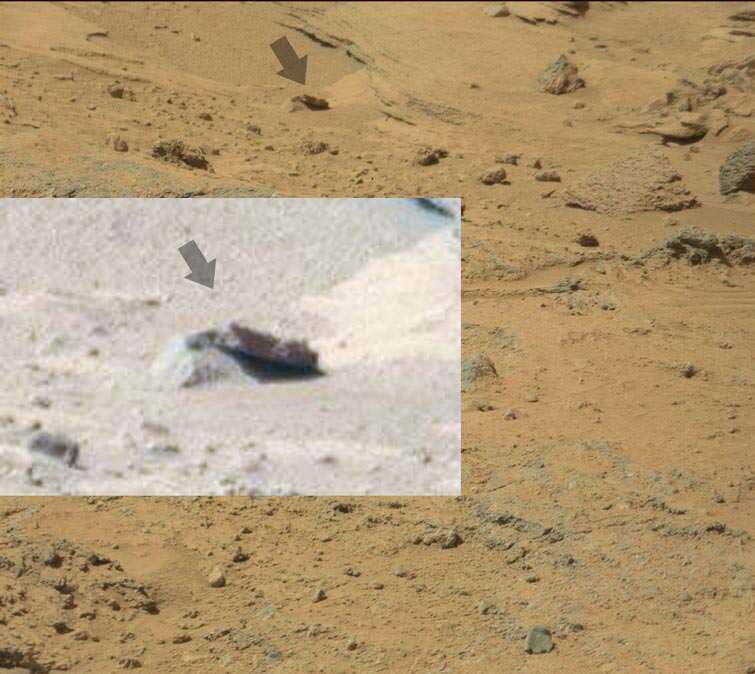 I was right this is a reflection or a very reflective rock, (arrow on far right) and the thing he thinks is an opening is actually just Curiosity's wheel being reflected back. But the martian letterbox is Not part of Curiosity, (l checked the rover in google images) or neither is the very reflective rectangular house, that coupled with the smiling grey letterbox, makes this a likely contender for a martian house. 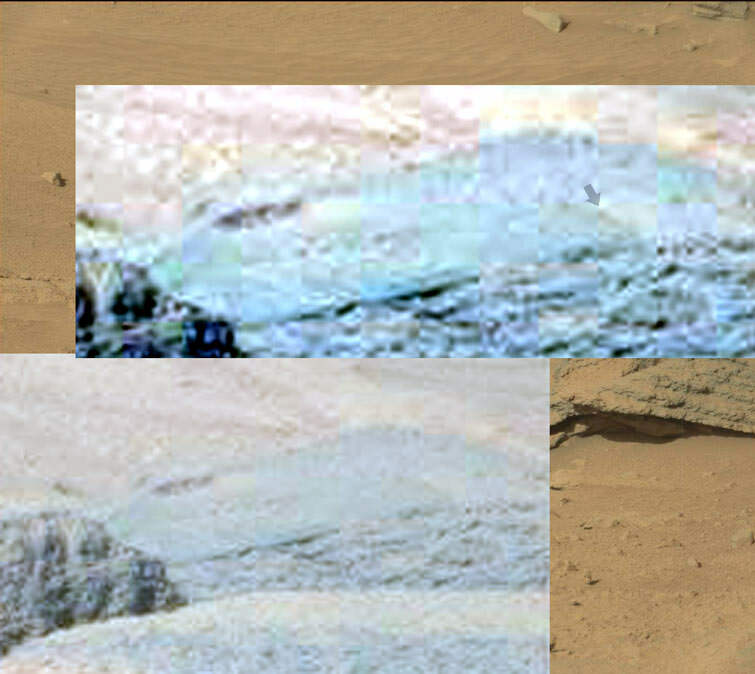 The other thing with the stripes isn't curiosity either, and l agree that NASA has fiddled or Photoshopped this, (they doubled up on the rover on the left, probably to hide a path) so much for trusting NASAF. These were taken from my video, so apologies for the quality. Similar house and obvious door. And this one which bears a strikingly similar look to the one above. But this one has a door, roof, stairs, and the white puppet type thing, which is a letterbox or way for him to stand out, (l am assuming that this is a business or hall of some kind). Yes, the rover drives through a metropolitan, Martian town, and we see nothing. 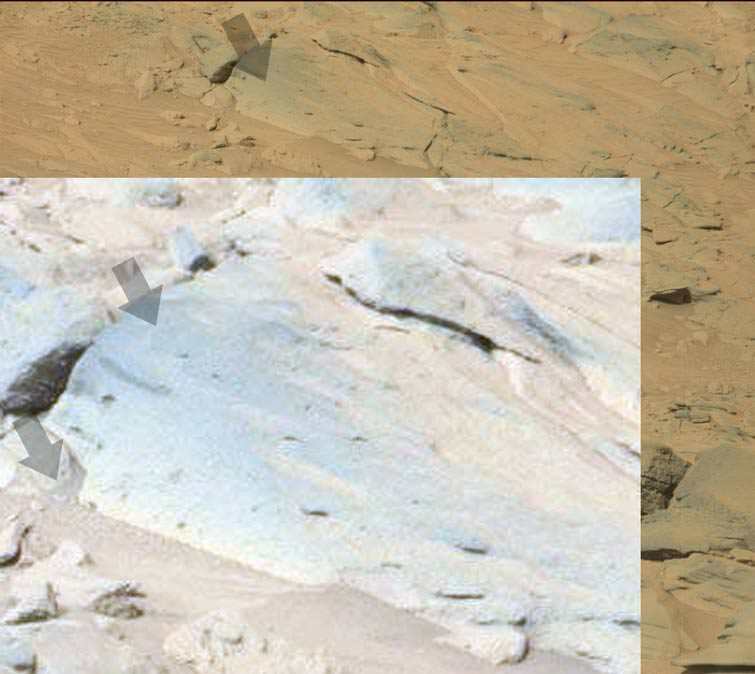 The vertical line showing Curiosity's wheel, is probably a fake line of pixels, as it doesn't quite match the white part, and most likely is hiding the real door, (we only see a hint of the door detail on the left) but the martians certainly like Aztec architecture. This is probably getting close to what NASA originally got, before they got their slimey claws into it. 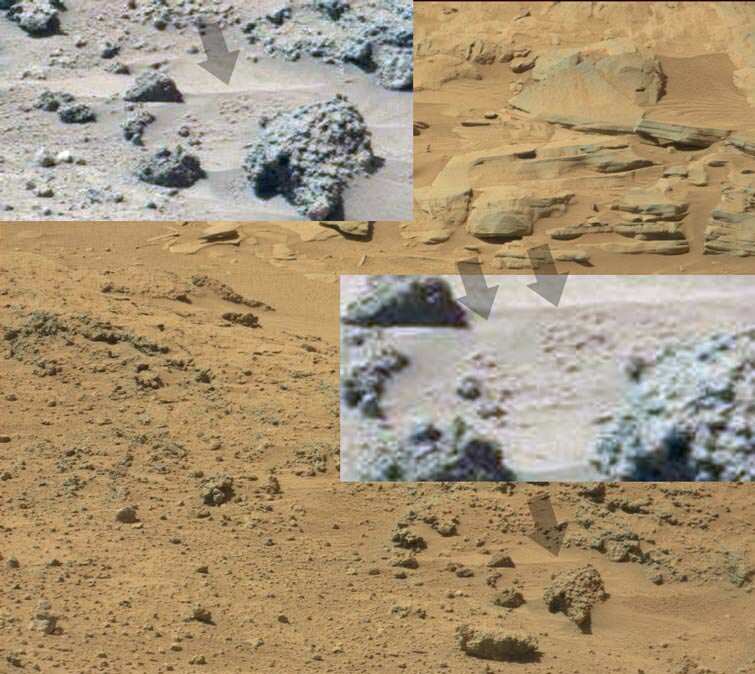 I believe that the thing on the right is a generator, (most likely one that spins forever) since l have seen similar devices before, (other possible houses on Mars). They don't seem to share our scr****g people for a buck philosophy, (centraliing power gen, and charging what they like)! Fossils, did some one say fossils!!! 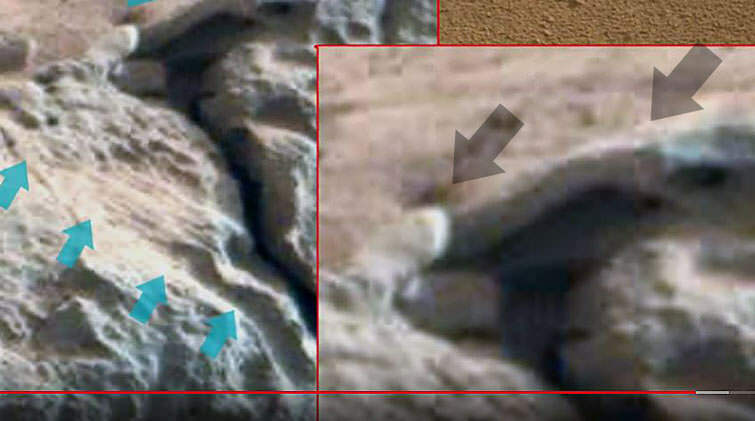 You wouldn't expect NASA to focus on real Mars fossils SpaceNut! lol They must have known they were crystalline in nature. Ones that NASA never comments on. Yes, NASA choreographed their intended route months or years in advance, so they wouldn't run into anything nasty, (a house, locals, etc). Must be pretty insane to work and Aimes Research Facility in California, sifting through Curiosity images,....no another stream with a few crabs and a plant or two, (shredder),....the locals are checking out the rover again, (shredder), and another house, sh, no we can Photoshop this and repeat that and it will pass our, Screw the general public mission statement. 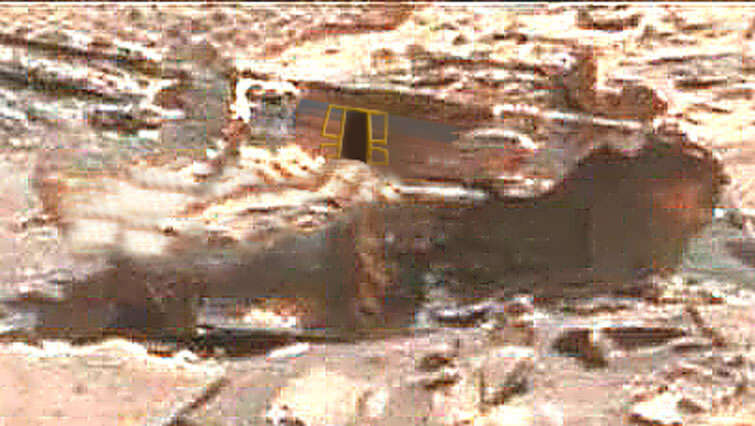 Curiosity's real mission is to show the population, that hasn't been dumbed down, that Mars is far from what they claim. But do it in a way that the sheep won't be spooked. No, better to project oil reserves, and shock the living daylights out of them in the near future? I think that most here will be thinking "Finally" and "now l can really go to town with these idiots. But that might just be me for the last one. 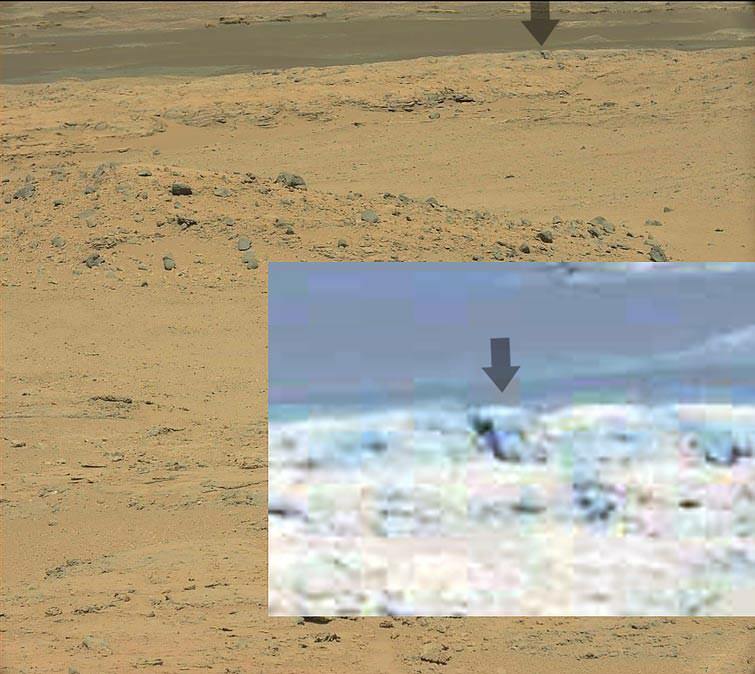 Curiosity, (the black bits are in the foreground) a blue hill, (that NASA never shows in its images) is in the distance, and so is the green stuff on the hill. This definitely isn't the rover, (no green on it anywhere) and looks like the locals have used water reserves to irrigate some trees, or plants, etc on this hill. Just posted conclusive proof that UFO's are real and NASA are well, l think that most here know by now what they are. I think that when someone asks NASA, "why are you hiding all of this" they should bring this up, and ask, "do you really think that we are that stupid"? More proof that Mars has orange/yellow sunsets like us, (you will notice that the sun is yellow). 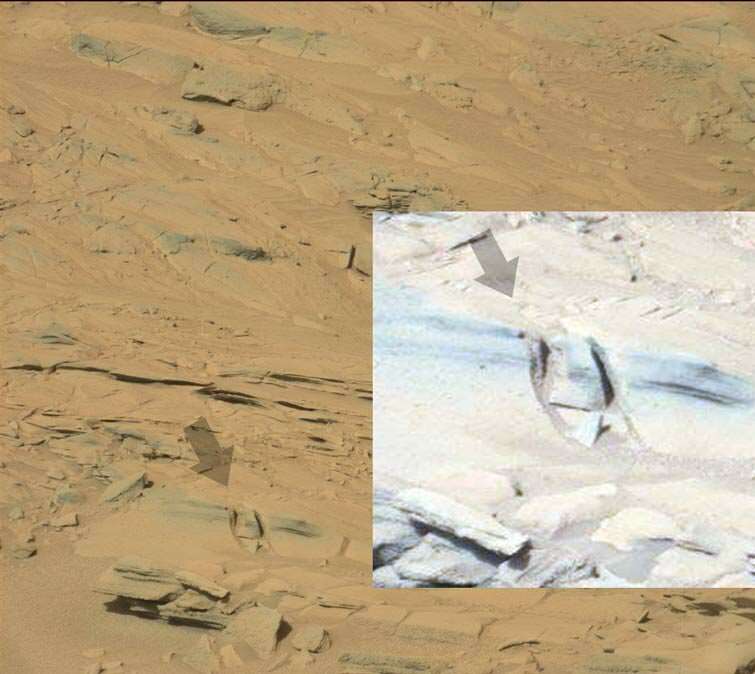 The face is Curiosity's turrent, reflected back to us, in a reflective weird rock. And this, showing an unmistakable light orange sun. People have asked me here and elsewhere why would NASA hide all of this? This is why, skip the video til you get to the 16 minute mark for the short interview. When mass media finally owns up, then a huge can of worms will become apparent, with Mars being the tip of the iceberg. And the ones that fight so hard to disprove UFO's, (eventhough as l have shown, some are legit) will be the most affected. And as l have witnessed elsewhere, anger and stupidity usually ensue. When mass media spills the beans, then there will be no more hiding, and no more attacking of the messanger. But there will probably be, mass benders, psychotic anger attacks, and hiding in a cave hoping that it will go away. So, we have plenty to look forward to, lol. 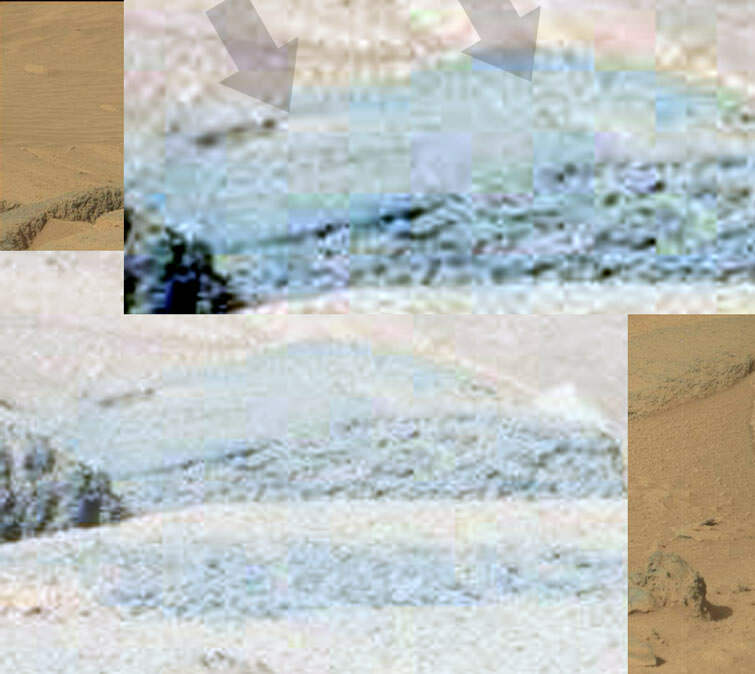 And a dust devil, that clearly has more power than NASA admits to, (pretty obvious considering the dirt it is sucking up) this was in other rocks in this image, so it is likely that it is a dust devil than dirt on the rock). 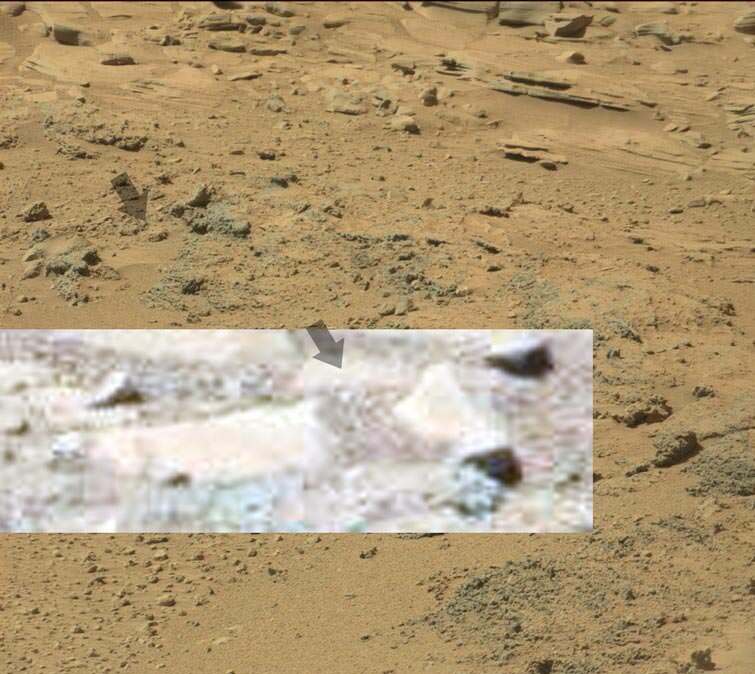 THis is weird, it looks like some of the sand on Mars is also reflective, (this is reflecting back part of the landscape and Cur, wheel). 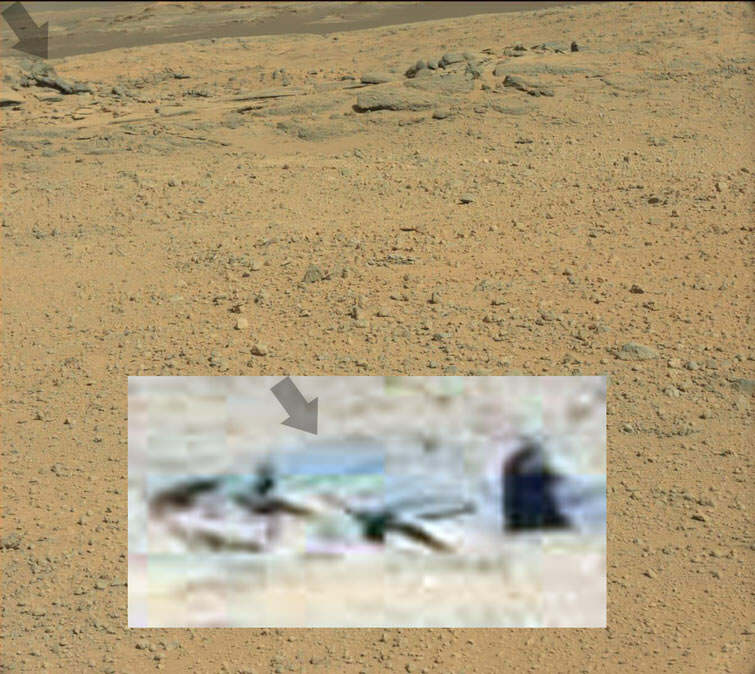 I almost missed this one, more curious aliens or grays having a closer look. 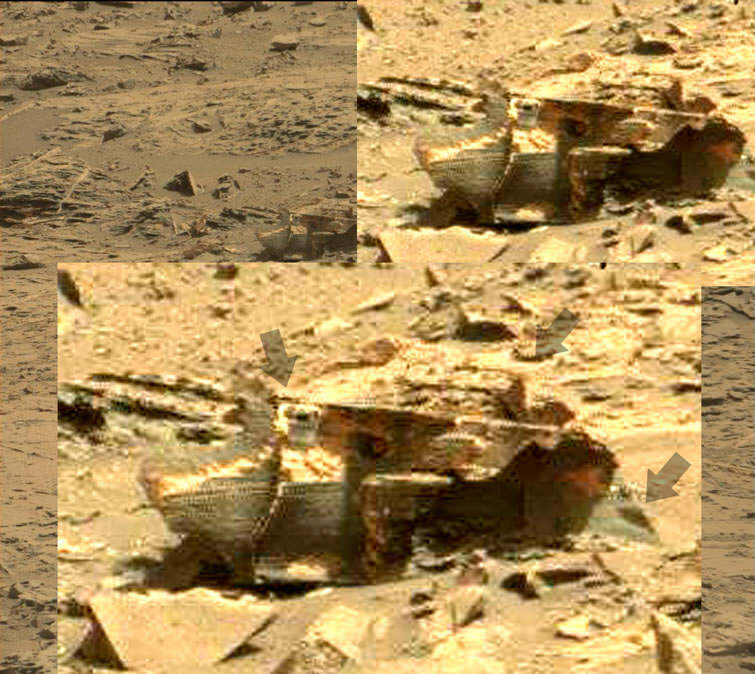 Since this rock is reflecting Cur, back to us, and the two aliens, they must be standing either side of the rover. One is smiling and the other less so, but if they were the benevolent, evil aliens the US keeps pushing, then they would have taken aim the minute the rover landed. From all of the evidence l have accrued here, they are a peaceful race, that is more advanced. This is weird, the hills behind the rover, are black. But on closer inspection they are dark blue, so distant hills. Which we never see in official images, l guess that blue mountains means, atmosphere. UFO thread has been updated. 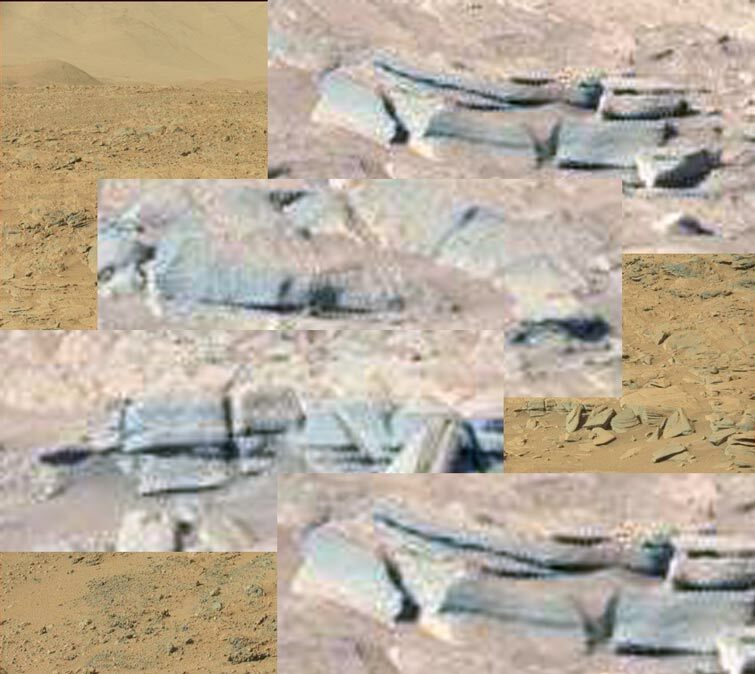 Another good look at the real mars landscape. And how water can wear down the rocks. 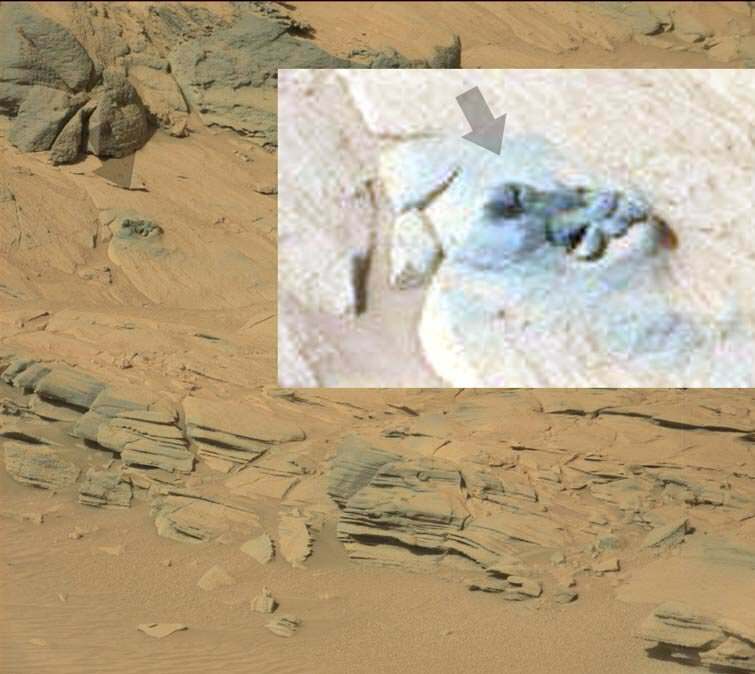 I would like to say that this is the rover, (but cannot) it is more likely an ancient depiction of a gray, but l am no paleontologist. Yes, not bad, but he and her are off in certain areas. 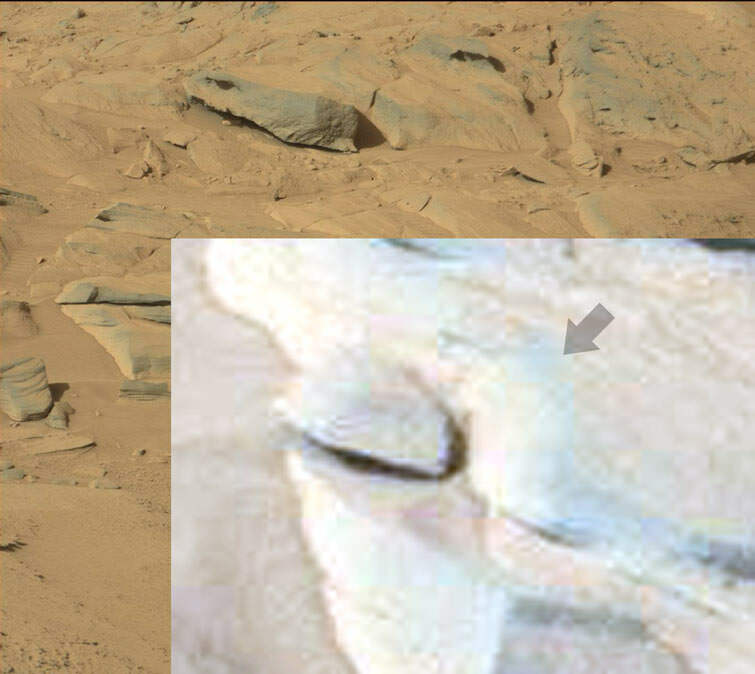 It is a very reflective rock for starters, so the white mast thing is Curiosity, the beard is the rock with the sun hitting it, but the face, hmmmm, l cannot get that to be part of the landscape, so it looks like a genuine face on Mars, but it is also a reflective rock, so they are off the track in some areas. And after closer inspection, l reluctantly have to say that the gray face sculpture l found previously is Curiosity's reflection only, sniff. 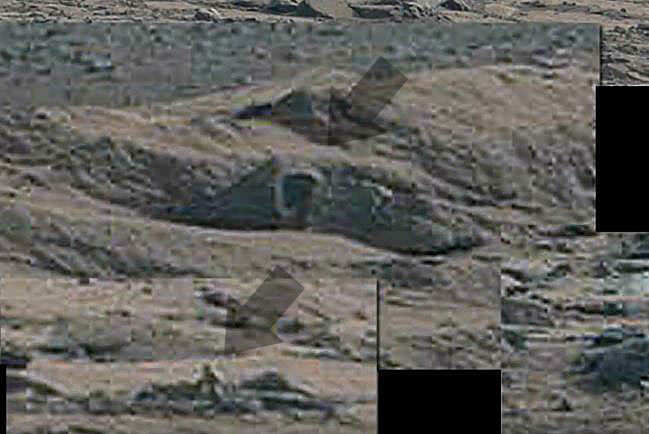 But the face they found and you posted, l believe is legit, and add's to humans being on Mars, or used to be. I think you could be right about the Curiosity mast in this case. 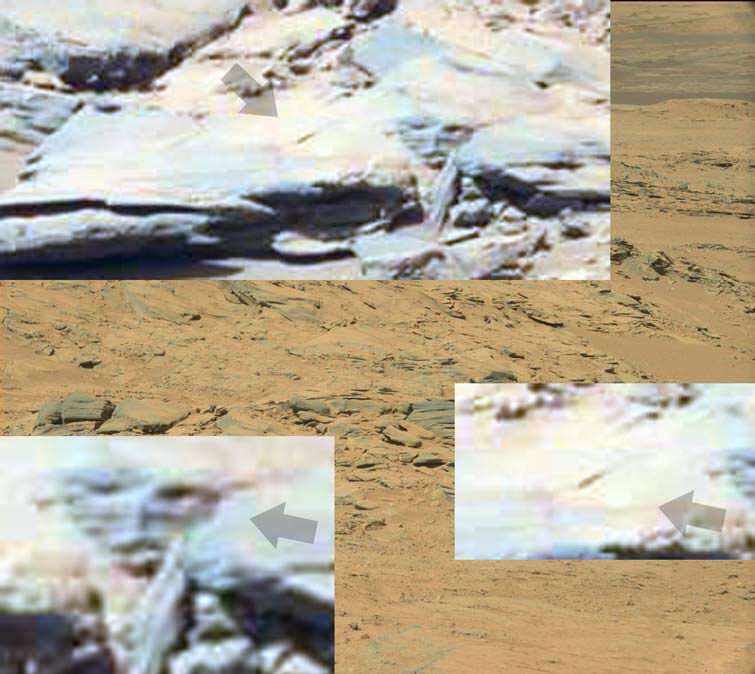 If so, the rock must be highly reflective, as it quite a clear image. 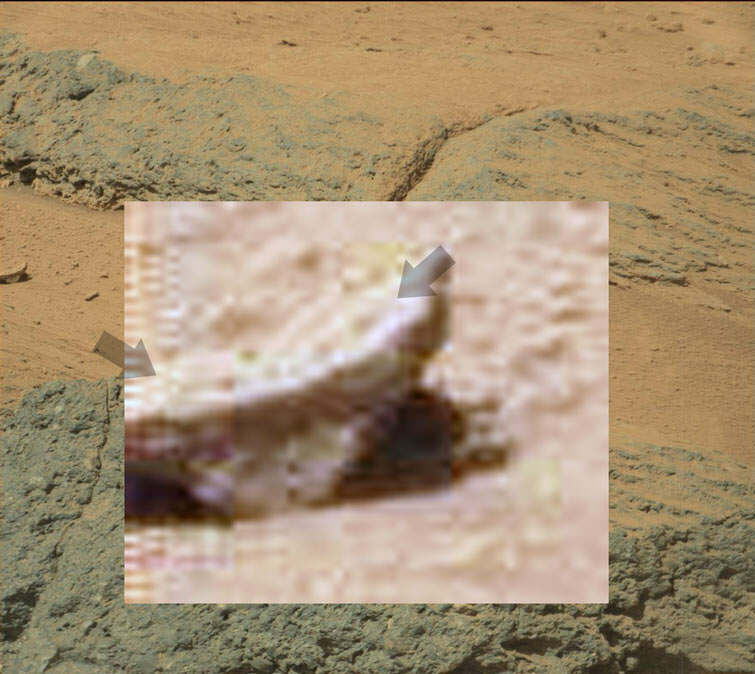 Yep, l am right about the mast reflection, and unfortunately there are a lot of amateurs posting this sort of thing online, and tend to get all exited about a reflective rock, (the hamster on mars, was such a rock only) and l hate to say it, but the baffolo creature on mars probably is also. From what l last heard Trump is going for the moon first and Mars second, no surprizes there, considering that Vikings first images and soil samples were correct. Not sure what these are, or whether they have structure, best guess they are distant dust storms or Dust-devils, or mini tornadoes. This is what a sunset looks like on mars, a white, yellow sun, (since it is the same as ours, just 40% more distant) with an Earthlike blue sky, and dark blue hills, (l checked the Sols, and this is a sunset). Not sure what NASA keeps showing us, (all blue) but it is BS. No, this is Mars sunset in a reflective rock, so the shadows match the setting sun location. This was also the last couple of images like this before the next Sol occurred or the next day. If NASA were right, then we should be seeing a blue sunset, in a blue sky, or only seeing blue, and saying that Mars sunrises are yellow/white/pink but their sunsets are blue only is a little crazy. About as crazy as saying that Mars atmosphere is blue according to All Hubble images, but is red most of the time on the surface. NASA has lied for a long time, and is trying to save their as**s, as we speak, and people blindly accepting this iffy data, is a worry that dumbing down society is working? When I look directly at the Sun, here on Earth, with my naked eyes, the Sun looks pale blue with a bright yellow corona. Most people depict the Sun as yellow, but that's not what I see. Everyone tells me I'm not supposed to look directly at the Sun, but it's right there, and how can just looking be bad? I'm careful not to stare, and never look at the Sun through a telescope. But perhaps what you're seeing from NASA images is what the Sun actually looks like. I saw an explanation of white balance by a professional photographer. He had a video camera. The video started indoors with incandescent lights, then he walked outdoors. Everything looked quite blue. Sunlight is actually blue. He then adjusted the white balance for sunlight, and colours appeared as they should. Modern video cameras have 3 presets for white balance: sunlight, incandescent, and fluorescent. These are the most common light sources. 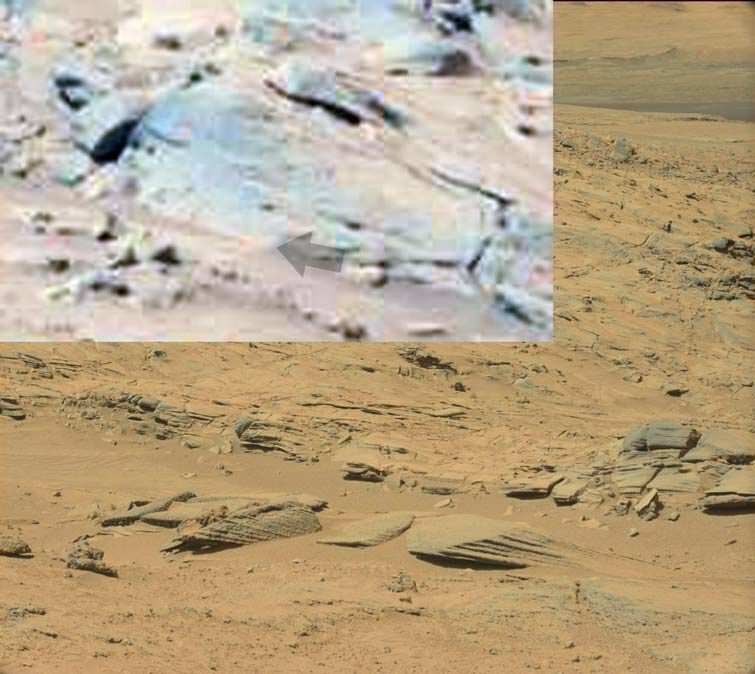 If you want to argue that a human standing on Mars would perceive colours as they appear after white balance, I could accept that. The process of "white balance" has been developed to mimic what the human brain does, so yea. However, that means the sky would also look as it does in images that have been white balanced. Realize Mars is not Earth. The sky on Earth appears blue for a couple reasons: oxygen, nitrogen, and most importantly water blocks certain colours, altering the colour of light that reaches the surface. However, scientists have said the greatest effect is scattering. Blue light is scattered by particulates in Earth's atmosphere. Mars has different gasses, and different particulates. Fines from the surface of Mars are carried through the atmosphere, colouring the sky with the same colour as the surface. The effect will change with weather; strong winds will hold more dust in the air, calm weather will allow dust to settle out. And the sky low to the horizon will have more dust because of the angle, while sky straight up will have less. NASA has said the sky low to the horizon is salmon pink, while the sky straight up is very dark blue. Then there's the sunset recorded by Opportunity. With a narrow band of baby blue right on the horizon, similar to a red sunset on Earth. Again, that effect is due to scattering.